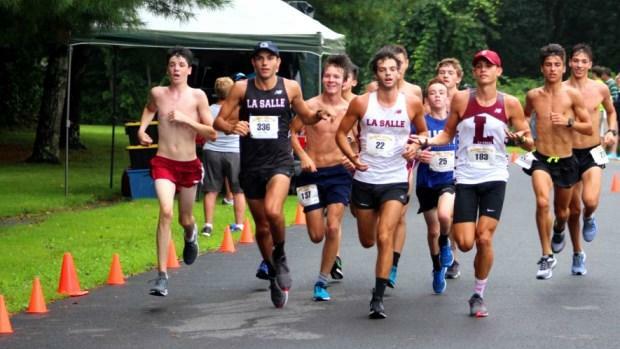 Past and present members of La Salle Academy finish together at Sunday's race. Josh Izewski of ZAP Fitness was a dominating winner of the Bobby Doyle 5M Summer Classic on Sunday. Under humid conditions, Izewski broke away from the pack early and won by almost a minute with a course-record time of 23 minutes, 32 seconds. Finishing second overall was Garrett Kenyon of Beaver Dams, N.Y., who was timed in 24:30.3. The top five runners in the field of more than 300 broke 25 minutes. Taking third was Louis Sarafini (24:35.8). He was followed across the line by Brian Doyle (fourth, 24:47.4) and Jeffrey Seelaus (fifth, 24:52.8). Izewski, a 2013 University of Florida graduate and former Central Bucks East (PA) standout, clocked an opening-mile split of 4:38. From there, he quickly built up a sizable gap over the chase pack. He was 9:15 at two miles and held a 40-second cushion over his closest pursuer by the 5K mark, which he passed in 14:26. Kaitlin Goodman, a Brown University graduate student, claimed the women's title with a time of 27:30.5. She was 18th overall. Aidan Tierney, a soon-to-be senior from Bishop Hendricken, was the top high school runner, finishing 15th overall in 27:13.4.